The film focuses on Jyn Erso (Felicity Jones) who is the daughter of a former Imperial scientist named Galen Erso (Mads Mikkelsen). After having a crisis of faith while working on a planet-killing weapon (read: Death Star), Galen decides to escape with his wife and raise their daughter on a planet under the cover of just being a farmer. Eventually Orson Krennic (Ben Mendelsohn) who is the Director of Advanced Weapons Research for the Imperial Military finds them. He worked with Galen previously and comes to bring him back to the Empire by any means necessary. Jyn escapes capture by Krennic and his Stormtroopers and is luckily rescued by an ally of her father named Saw Gerrera (Forest Whitaker) who is a veteran of the Clone Wars and seen as an extremist by the rest of the Rebel Alliance. Flash forward, Jyn as an adult being rescued by the Rebel Alliance due to her connection to her father and his work with the Death Star. Alongside a rogue-ish rebellion supporter Cassian Andor (Diego Luna) she goes off to try and meet with Saw Gerrara and ask for his help. 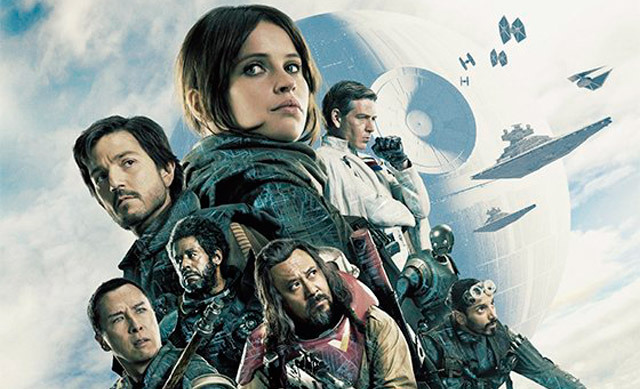 Along the way, her team is rounded out with K-2SO (voiced by Alan Tudyk), a reprogrammed Imperial droid who can’t stop being brutally honest with everyone he comes in contact with, a recently defected Imperial pilot, Bodhi Rook (Riz Ahmed), a true believer of The Force, Chirrut Îmwe (Donnie Yen), and his assassin buddy Baze Malbus (Jiang Wen). The six characters are well rounded and each of their individual stories is told for the purpose of emotional weight in the final sequences. The relationship between Chirrut and Baze stood out to me as some of the entire universe’s best emotional weight. Jyn Erso’s character fits with the group not just as a de facto leader but also as an amoral compass of sorts early on, no true morality just moving from one moment to the next. As it was mentioned previously, the movie works as a classic war film in its design. Jyn’s reluctance to care about the impending rule of the Empire over the galaxy mirrors many reluctant citizens in past films surrounding WW2 or Vietnam. Not until the fight becomes personal does she feel the desire to truly get involved. This point is driven home in a meaningful way when Cassian’s character calls her out on it. Giving the lead character an emotional damage and vulnerability that makes her rise that much more meaningful in the end. In classic Star Wars fashion there is a final strike that the good guys have to do to take on the bad guys for some means. I say this as not so much a cliché but just a point of fact. When the battle begins this shows that balls to the wall spectacle that Gareth Edwards showed in Godzilla but cranked to 11. Ground fighting, TIE vs. X-Wing aerial dogfighting, and emotional devastation as the plans for the Death Star hang in the balance. The last sequence doesn’t hold back and its everything you love about the action of the universe. A simultaneous fight on three levels with no moments of slow dragging exposition. What you have when the smoke clears is a damn good Star Wars movie that ends just before the original and creates the desire to pop in that DVD the second you get home. You know the end, but the journey is all worth it. Last, but certainly not least, yes Darth Vader is there and he is goddamn terrifying when he shows up. He’s the Vader we know from the comics and books, you understand why everyone is scared of him in the original trilogy. They have every right to be after what he does. Rogue One, breaks the curse of prequels in the Star Wars universe with style and grace...run to see this movie.